Next. Okay, these are not the completed arcs, they are just the arc segments. I still have a wee bit of homework to do before my next Double Wedding Ring Quilt class on Thursday. So far, I’m on track and amazed (again) at how smart our teacher, Miss Johanna is. 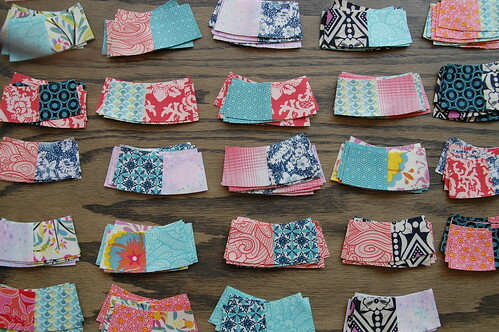 Look at how cute those 216 little pairs are! And I spent way too long browsing through all the lovely colour-arranged photos here. Gorgeousness. those colors are really amzing !!! i love the color combo, karyn. especially the aqua/teal+coral combo. 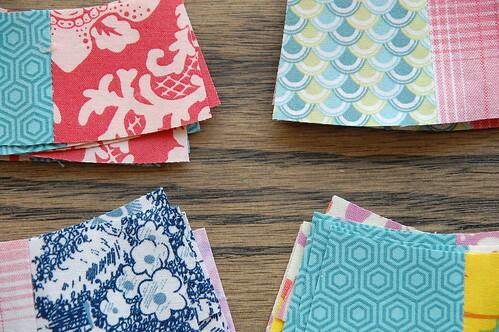 it makes me want to go fabric shopping! GORGEOUS!! I just want to pet them, they are so lovely… Get ready for class #2!! Yay!!! Hey, thanks for the link. I’m not a quilter but those vintage quilts were so gorgeous. 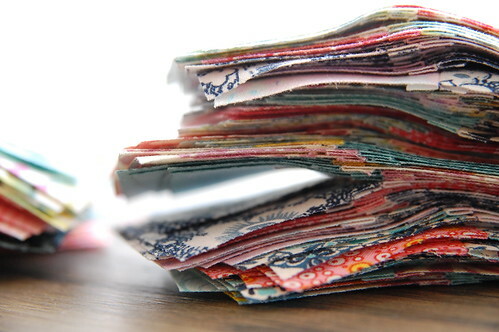 I really love your blog and have been reading for a while. I keep wishing we had something like the workroom here in Vancouver. BTW Those wooden cross stitch pendants are fan.tas.tic.